Stanton in PeakSchool was built in 1879 and at that time it consisted of a school and schoolhouse. It is now a Church of England voluntary controlled school. This means the Trustees, rather than the State or the LA, own it. Unlike some ‘Faith Schools’, a Church of England school’s aim is to provide a service to all the children of the parish, whether or not their parents attend church. However the school is proud to be a church school and the school ethos is broadly Christian. As a Church of England controlled school we have two Foundation Governors. Their role is to maintain the Church’s influence on all aspects of the school. As in all schools we are inspected by Ofsted and, in addition to this, we also receive a second inspection of our ChurchSchool status. "The school, through its distinctive Christian character, is outstanding at meeting needs of all learners". "Its family atmosphere is evident in the way pupils care for one another, fully understand the concept of forgiveness in a climate of trust and truthfulness". "The successful and genuine relationships between all learners and adults within the school community show how well Christian values pervade the school". "[Stanton in Peak] provides a broad, interesting and creative curriculum, a range of clubs and after school activities including sports, the arts and music". Please use the resources tab on the website and follow the link to read our full Church School Inspection. This is our new Church School Banner. 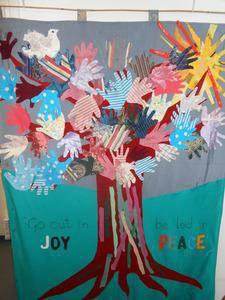 Each child in school has drawn around their hand and they have been used to make the leaves on the trees. "Go out in joy, be led in peace and the trees will clap their hands!"